American University of Sharjah (AUS) Sustainability recently hosted the second lecture in its Sustainability Speaker Series. 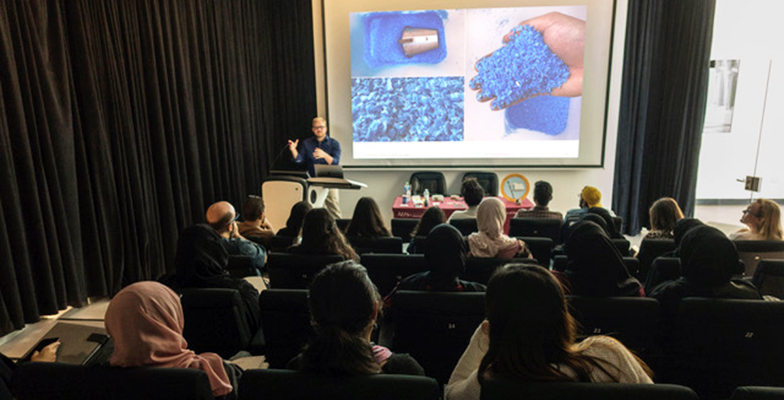 Felix Beck, Assistant Professor of Practice of Design at NYU Abu Dhabi (NYUAD), presented NYUAD’s Plastic Recycling Research Lab to a multidisciplinary group of AUS students and faculty members. The talk was driven by a call to fight the pollution from single-use plastic and start to see plastic as a precious resource with an extended lifecycle. Plastic pollution is known to be one of the biggest threats to our ecosystem. According to the Denmark-based NGO Plastic Change, the world produces one million plastic bottles every minute. At this rate, oceans will contain more plastic waste than fish by weight in 2050. Felix Beck’s research has been heavily influenced by “Precious Plastic,” a global community committed to sharing knowledge, tools and techniques in the fight against plastic pollution. The beating heart of this community is a series of blueprints and tutorials for building four basic plastic recycling machines. The shredder machine turns plastic waste into small flakes, which can be turned into plastic filament, or thread, via the extrusion machine. The plastic filament can be used to make new raw materials using 3D printing. Alternatively, plastic flakes can be heated and injected into small molds using the injection machine, or injected into bigger molds using the compression machine. Zlatan Filipovic, Associate Professor of Art and Design at AUS, who collaborated with Felix Beck during the recent Precious Plastic WANA Conference hosted at NYUAD in December 2018, has since embarked on his own journey into plastic recycling research and proudly demonstrated his self-constructed injection machine after Beck’s talk. AUS Sustainability is working with Filipovic and the AUS College of Engineering (CEN) to expand the Precious Plastic initiative at AUS and hopes to have a plastic recycling lab in the near future. AUS Sustainability is working to coordinate a visit to NYUAD to visit the Plastic Recycling Research Lab that Beck has started and to further engage students and staff to think about the possibilities and impact we could have at AUS if we tried to close the loop on plastic recycling here on campus. The Design Build Initiative (DBI) at the College of Architecture, Art and Design (CAAD) enabled CAAD labs and its metal workshop to bring in two specialists – for short residence – who trained faculty and students this semester and also contributed to the construction of the Injection Machine, one of four machines from the Precious Plastic Machine Workflow.